Long before the Davy Crocketts, the Daniel Boones and Jim Bridgers, the French had pushed far west and north establishing trade and kin networks across the continent. They founded settlements that would become great cities such as Detroit, Saint Louis, and New Orleans, but their history has been largely buried or relegated to local lore or confined to Quebec. Foxcurran, Bouchard, and Malette scrutinize primary sources and uncover the alliances, organic links and métissage, or mixing, between early French settlers and voyageurs and the indigenous nations. It began with the founding of New France by Samuel de Champlain in the early 1600s and continued well into the 19th century long after France was no longer a force in North America. The authors have combined keen and accessible story telling with vintage maps, forgotten documents (such as the little known writings of Alexis de Tocqueville), and old photos or paintings. 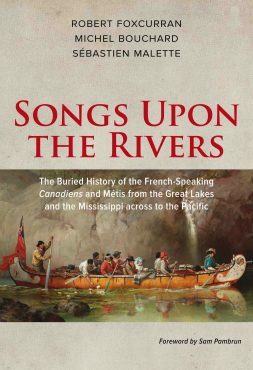 What they have discovered and now recount will propel the story of the peoples engendered—and still thriving—, their French lingua franca, and their ways of life back into the heart of the narrative of North American history where they belong. Alexandre Guerrette dit Dumont. 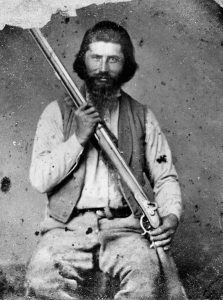 Born 1815 at La Baye verte (Green Bay), Wisconsin, Dumont was one of the earliest settlers in Oregon’s Umpqua region. Songs Upon the Rivers also challenges historical orthodoxies. The French-speaking Canadien and Métis, who descended from the French and indigenous nations, developed a hybrid culture invigorated by their close kinship ties with the indigenous peoples across the continent. Yet they kept their French songs and language, which effectively made French the lingua franca of the American and Canadian West well into the 19th century. Robert Foxcurran is an independent historian who holds undergraduate degrees in French and Japanese studies and a Masters in Business Economics and Business History. He worked for Boeing in various positions including economic analyst and project historian. He lives in Seattle, Washington. Michel Bouchard is Chair and Professor of Anthropology at the University of Northern British Columbia in Prince George, where he lives. Born and raised in a French-speaking community in Northern Alberta in the shadow of the historical fur economy, he has researched ethnicity and nationalism, particularly in Eastern Europe and Russia. His current concentration is the history of French-speaking populations in Western North America in the 18th and 19th centuries. Sébastien Malette is an Assistant Professor of law at Carleton University, Ottawa. He holds a PhD from the University of Victoria, BC, and did postdoctoral studies at the University of Melbourne. Specializing in Métis and French-Canadian heritage, he is an expert in Aboriginal law. Sébastien Malette lives in Gatineau, Québec.